I purchased a Black Ghost Knife about a 6 weeks ago, and have become quite fond of it. I was feeding him today, and my roommate noticed that he has a strange bump on his abdomen. There is also a smaller one on the other side. occasionally, and bits of Omega One freeze dried shrimp. Can you tell me what caused this bump and discoloration? Could it be the gravel substrate? How can I help it go away? Ammonia 0, Nitrite 0, Nitrate 10-20 (I hope the pH isn't too acidic? but the tap water is 6.8 and I don't want to artificially raise it). Don't know the hardness but I know the tap water is quite soft. 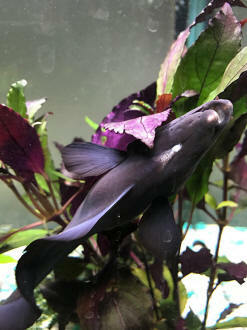 I treated with Metroplex for 14 days (until I ran out) - by medicating his food + adding to tank water, but he refused the medicated food and now isn't really eating at all. http://www.fishfuelco.com.au/products/community-food/ , bloodworm, freeze dried Tubifex - but then just spits it out. He is also back to his usual alert and active self, but the stringy poop remains and I am really worried because he has lost so much weight and still isn't eating. Can you suggest any other foods to tempt him? What about live foods (he made short work of some neon tetras I foolishly put in the tank a couple of years ago - oops). When the new supply of Metroplex arrives I've been wondering about trying to dose him directly with a tuberculin syringe but I'm afraid I could hurt him or worse. Any advice on this? have added Epsom salt @ 1g/L. Please see attached photos showing his belly. Hi! 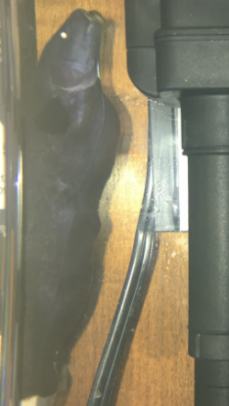 I'm having a real problem with my black ghost knife! We recently got Camallanus worms in our tank (still not sure where it came from). We just treated our tank with Levamisole HCI powder yesterday. It told us to cover the tank for 24 hours to let no light in. Well we just removed the blankets, and our BGK seems to have a large lump where his 'neck' would be. He also seems to keep his face pointed inside the bubbles. Any idea if this is normal or not? My buddy sent me this photo. His black ghost knife has a hole with red and white strings hanging out under his body near the mouth. I checked your site and the web and can't find anything on it. Can you help? Sorry pic is terrible . <Indeed it is! 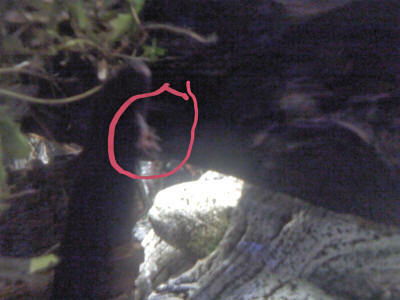 But short answer, likely a combination of physical damage (scratched by rocks, nipped by tankmates, etc.) and environmental shortcomings of some sort (non-zero ammonia and nitrite for example). To be clear: most problems with Black Ghosts are down to three things: [a] the way they're kept, [b] the way they're kept, and [c] the way they're kept. In and of themselves they're not particularly prone to disease or plagued with parasites upon import. But they are highly demanding fish. Let's go through what your buddy needs to provide. Firstly, a big aquarium, 55 gallons would be too small, 75 gallons for an adult a bare minimum, and anything up that much the best option. Juveniles don't last long in small tanks (20 gallons for example) and usually end up dead under such conditions, so even if this is a youngster, you'd be starting off with 40, 50 gallons and upgrading quickly. Next up, filtration. As fish from rapids and riffles and places around waterfalls, they like water movement and high oxygen levels. Big canister filters and the like are what you're after. Turnover rates upwards of 8 times the volume of the tank per hour. Low nitrates are a plus, so regular water changes. Water chemistry itself isn't a big issue, so you can be liberal with water changes even in moderately hard water areas. Diet is a big problem for many folks. While they sometimes take pellets, they're mostly micro-predators and expect a varied diet based around insect larvae, small earthworms, enriched brine shrimps and so on. A monotonous diet based on frozen bloodworms for example won't work though. Definitely no feeder fish! Because they can't be medicated with anything containing copper or formalin, you need to avoid situations where these might be needed. Quarantine tankmates (better yet, avoid them) and ensure there's nothing in the tank that could damage them (sharp rocks, for example). I'm guessing yours has some sort of ulcer, perhaps caused by gravel (don't use gravel, use smooth silica sand) or jagged rocks (provide lots of smooth caves in the form of plastic or ceramic pipes). An antibiotic will be necessary, and don't use anything else unless it expressly states it's safe with stingrays (most aquarium store medications aren't). Remember to remove carbon from the filter while medicating. Thanks! He does have gravel. He thought a clown loach might be the one causing it. I have a 28cm ghost knife who is around 5 years old living in my 250 litre tank with several discus fish and angels and a few catfish cleaners. In the recent 3 months my ghosty has shown several like blood spots on his tail and now has a few more initially I presumed that my sucker fish were sucking algae off him and therefore creating blood type blisters but it is getting worse. for this collection of fish! Americans often use the letter "L" after an aquarium to denote a "long" rather than "deep" aquarium, but I've never come across a 200 gallon "long" aquarium because there isn't anything called a 200 gallon "deep" aquarium so far as I know. So, confusion reigns! I got them all around the same year so the Knife fish is at least 9yrs old. I do weekly water changes and have a canister filter. Over the last year my Black ghost has developed these strange lumps that come and go ? I have a full test kit so I will test everything you have asked me too, I do have to admit I have been very slack on water testing as I have not had any problems or fish loss up until the last year or so, I will get back to you with the results asap, again thank you so much ! I have a well established tank. Nobody bothers my ghost knife. I have had him for about 5 years. He is approximately 8 inches long. I just noticed what looks to be a tumor on his side behind his fin. It seems to have appeared almost overnight. His behavior has not changed. I don't know if I am paranoid or if he is breathing heavy. I just did a water change but plan to do another and I will add aquarium salt to the tank. I would hate to lose my Ghost Knife but I do not want him to suffer. What should I look for and what can I do. Please help. I'm wondering if you can help me as I can't find an answer anywhere. 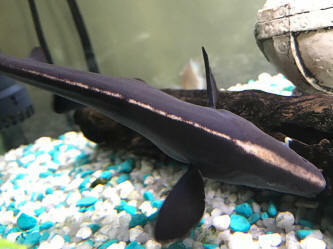 We have a Black Ghost Knife Fish who is about 4 years old now and is a rather big boy. We have noticed his belly has really bloated up. I have been told it could be constipation or over feeding. Is this a common problem with these fish, he has never been like this before. <The problem with Apteronotus albifrons is most people don't keep them alive for very long. They are extremely demanding fish, and while juveniles can do just fine in a community tank, as they mature, their demands become more difficult to meet. Remember that these fish come from shallow, fast-flowing water, so they're used to high oxygen levels and spotlessly clean conditions. Water flow rates should be very high, upwards of 8 times the volume of the tank per hour, and adding additional airstones or powerheads to provide additional water flow near the bottom of the tank wouldn't be a bad idea at all. By contrast, the average 55 gallon tank with some cheap-and-cheerful hang-on-the-back filter just isn't going to cut it. He also seems to be gasping for air a little but I'm guessing that's the pressure on his little lungs. What can I do to help him. ? I have just done a 50% water change encase it's the water quality but I have many other fish including Clown Loaches and they are all fine. I also got told it could be Tuberculosis but ???? Hello crew, I writing to you about my BKGF. I got him about a week ago and seemed fine until 2 days ago. the bottom of the tank. Is this some sort of illness, or could it be that he got into a fight with the other fish and broke its back? Please I need some advised, I don't want to lose this fish. 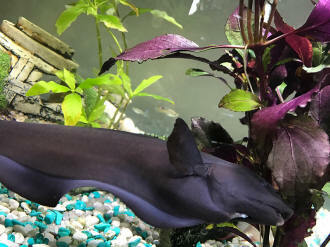 I have a black ghost knife that has been in the same 30 gallon tank for 10 years, he was a baby when we got him. He has always been quite happy and not aggressive. Today I noticed he is at the top of the tank and has a bloated underbelly. He is upside down and laying on top of the underground filter, but he is still alive. Can you tell me what this is and if there is anything we can do for him? 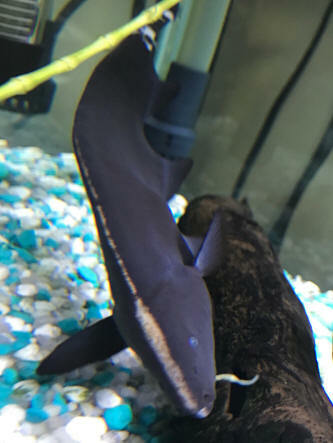 I just got a black ghost knife fish as a gift from my daughter but he seems unhappy just laying around and hiding all the time also he keeps getting stuck to the filter and seems unable to swim right like the bubbles are pushing him around...do I have a problem?